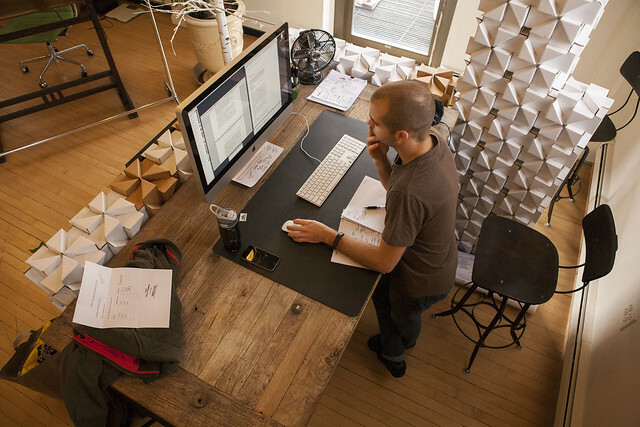 Studio Desks: Eric Benoit | Flickr - Photo Sharing! ChrisCavallucci, Ilia A, aligalii, and 14 other people added this photo to their favorites. Thanks for the heads up, Margaret. Looks great! Where did you get that desk? Love it! It's a modified Restoration Hardware FlatIron desk (www.restorationhardware.com/catalog/product/product.jsp?p...). A local industrial and furniture designer, Miles Endo (studioendo.com/), did the lovely work. The wall partitions… is that… cardboard?! Is there a link where one can get something like that, or was it homemade?